We’ve just come to the end of the latest run of Developer Direct webinars on Delphi and C++Builder that I posted about when they started. The closing slide had a bundle of collated links on, so I thought I would copy (and, where necessary, correct) them into a post and make them searchable/locatable just in case that ever happened to be vaguely helpful for anyone. It’s been a busy 6 weeks for me in terms of conferences. I used to be a regular speaker on Delphi and C++Builder topics at international conferences in the late 1990s and early to mid-2000s, but haven’t really been doing much in that area in the last semi-decade for various reasons that have no mileage in verbalising. However this autumn/fall I’ve thrown myself back into it as much as was feasible. There’s been some chatter over recent months (and maybe even years) over the pending 64-bit C++ compiler for Windows from Borl^H^H^H^H Embarcadero. And now it’s here – the press release can be found at this link! Released days ago it’s a free update for users of C++Builder XE3 or RAD Studio XE3 and is now included in the install for new customers and in the trial version. So C++Builder can now generates 32-bit Windows and OS X applications and 64-bit Windows applications. The beta program for the mobile support (for iOS and Android) is under way and expected to be done by the end of the first half of 2013. XE3 customers have priority access to the beta program. David I posted up a great a potted history of Borland/CodeGear/Embarcadero’s C and C++ technology in this post, which charts the course from Turbo C on DOS through Turbo C++ on DOS and protected mode DOS, Borland C++ on DOS, Windows 3 and 3.1, then OS/2, Turbo C++ for Windows 3.1, then C++Builder for Win32 and (briefly) C++Builder X for enterprise and mobile platforms. Interestingly the post skips over the C++ compilers present in Kylix 2 and 3 (November 2001 and July 2002 respectively), which targeted ELF executables that run on Linux. The new 64-bit release is based on the CLANG compiler front end and the LLVM optimising compiler back end, with Borland/Embarcadero extensions added in to work on VCL/FMX applications. It’s the first commercial CLANG implementation that targets Windows, so a lot of work was required to get this project to this point of being released. The focus of this release is language conformance and support for C++11, which comes from the work already done by the CLANG project and now available to C++Builder customers. There are some blog posts on the new C++11 features in the list below. You can see what’s new in this release in the online docwiki. I write this post not long after the C++ version of the free online CodeRage 7 conference has finished. The Win64 C++ compiler was announced at the start of the conference, and the conference sessions should become available online real soon, as the sessions from the Delphi CodeRage 7 have done. One of the first sessions on the first day of the C++ conference was a chat between David I and Bjarne Stroustrup (work page and home page), the designer and original implementer of C++. It was great to hear his views and opinions on all things C++. There’s a write-up of that session in this blog post. To celebrate C++Builder’s move into the 64-bit world David I is spending much of December blogging about C++ in what he calls The 25 Days of C++mas. Current posts are as follows. I’ll try and add to this list a the days go by. 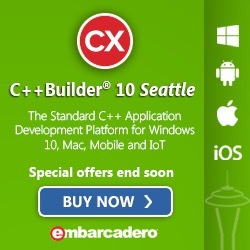 Get a C++Builder 64-bit Boost! Delphi XE3, C++Builder XE3 and RAD Studio XE3 have been out a few months now. Back in October, David I released a video per day of the month to highlight new features in some of the various products that make up RAD Studio XE3: Delphi XE3, C++Builder XE3 and HTML5 Builder (I didn’t immediately notice anything relating to Embarcadero Prism XE3). These 31 videos have been grouped together in an October calendar page entitled the Oct 2012 International RAD Studio Film Festival. If you have XE3 or are looking at upgrading to it you should take a look through some of these videos to see some of the newer features.